The Karakachan is one of the oldest dog breeds. Its ancestors started forming as early as the third millennium BC. The dog is named after the Karakachans – nomadic shepherds of Thracian origin and the oldest inhabitants of the Balkans. The breed flourished for centuries until, in the 1940s, the Bulgarian Communist Government nationalized the farming industry. 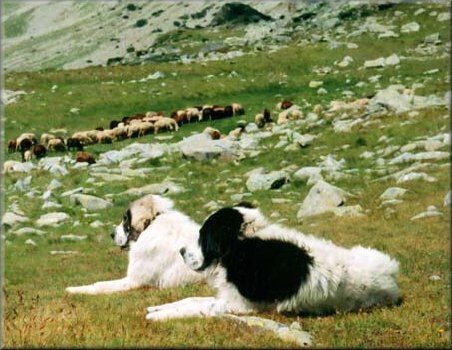 All livestock were placed in communal farms and the Communist regime ordered extermination of the Karakachan dogs whose services were deemed unnecessary on the collective farms. It was at this point in their history that the Karakachan dog became dangerously close to extinction. The word Karakachan is derived from two Turkish words kara and kaçan, kara means black and kaçan means the one that got away. Therefore the word Karakaçhan has the meaning: the black one that got away. Through the dedicated efforts of a few special people in Bulgaria and around the world, the population of the Karakachan dog has grown steadily and there are 700 worldwide. 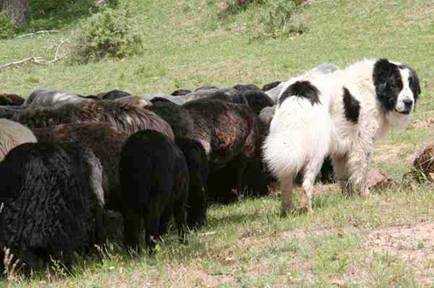 There are less than 200 Karakachan dogs serving as livestock guardians in the United States. 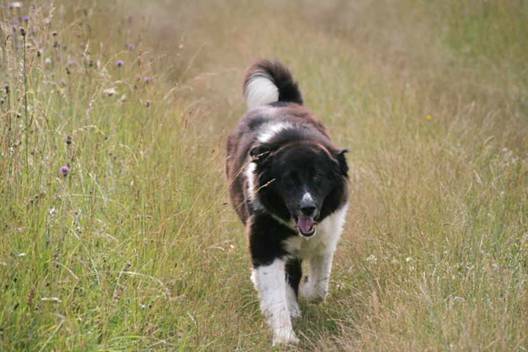 The main purpose of the Karakachan dogs past and present – is the protection of flocks against predators and intruders. These attacks are carried out mainly at night and for this reason, the shepherds wanted dogs that had white markings as they can be easier to locate these dogs in the dark. Just as important was the fact that the dogs remained with their flock in any weather. This led to the existence of dark markings in color which clearly contrasted with the snow in winter. The Karakachan dog protects his family and flock. Loyal yet independent, these dogs are extremely reliable protectors of livestock. They adopt their charges as part of their “pack” and are highly territorial. All of these qualities combined with endurance, dedication and willingness to work, make them a wonderful protector and friend.